Get in early. That’s the helpful tip-off that locals gave me two years ago when I mentioned that I wanted to camp at the Cygnet Folk Festival. Not only do the camping passes sell out before the event, but the campground fills up quickly. 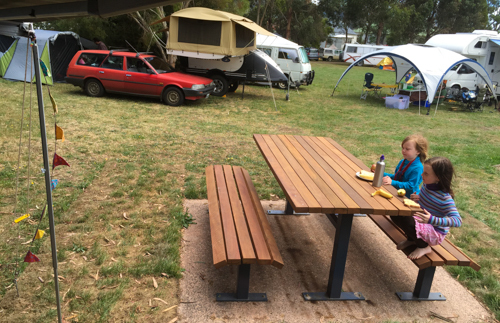 During the festival, the grassy peninsula of Burtons Reserve is opened for camping. Makeshift showers are erected and festival volunteers monitor the entrances to keep out those who haven’t paid for camping. A caravan park at the other end of town handles the overflow and also caters for those with dogs. 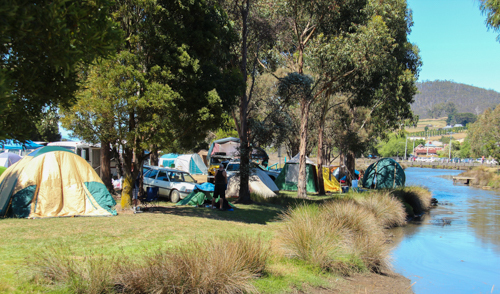 For one weekend a year, the bird sanctuary of Burtons Reserve becomes a tent city. We arrived on Thursday, hoping to get the same excellent spot as we had last year, but it was already taken. Without any sites marked, campers park their vehicles and set up their tents in whatever configuration best suits them while still leaving a reasonable access-way for vehicles. The shady spots are the first to fill up, and late-comers gradually fill in the sunny gaps. I like parking near the playground as that’s where the girls spend most of their time. For a family like ours, the festival is less about the musical performances and more about connecting with other lovely people at the campground and around town. Kids camp for free, and so this makes the festival extremely attractive to families — especially as there are enough free events happening all weekend to entertain the family. The girls take their meal outside to eat at the picnic table. It's a lovely community atmosphere as we discover that we're surrounded by families whom we've met at other festivals. 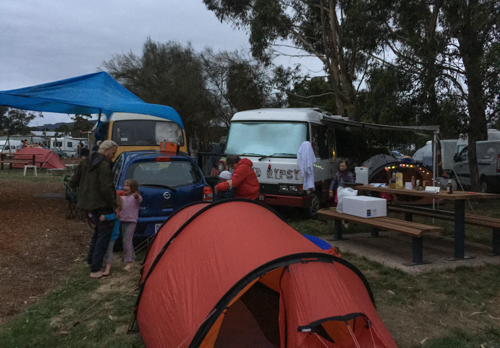 This year, we were fortunate to be joined by two family members who flew over from the mainland, as well as friends whom we had met at the Tassie Circus Fest, Rainbow Gathering, and last year’s Folk Fest. We jealously saved tent-spots for those in our group who were late in arriving and somehow managed to build our camp around a picnic table! As extended family arrive, our bus starts to become surrounded by tents. Based on this year’s success, I’ll repeat the winning formula of buying our Cygnet Folk Festival camping passes early (ticket sales usually open on 1 September) and arriving on Thursday at Cygnet. As our network of friends grows, so does the camping village that sets up around us, and I look forward to expanding our camping community at the next Folk Festival!